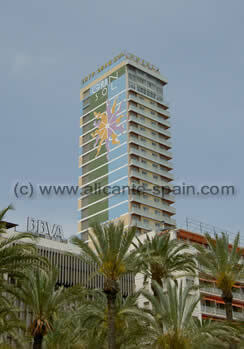 Located in the harbor area of Alicante, the Tryp Gran Sol Hotel Alicante is kind of landmark of the city. For whatever reasons it is one of the tallest buildings in downtown Alicante, with no other high skyscrapers surrounding it. This makes it a really perfect location to enjoy a wonderful view at the harbor area or over to Santa Barbara Castle. The Tryp Gran Sol Hotel offers over 120 rooms ( check pricing and availability here ) and all the comfort of a 4 star hotel. But the real main attraction in my opinion is its Mirador Restaurant on the 26th floor. It offers you one of the most impressive views on Alicante you can imagine. This together with an excellent cuisine make it one of the key attractions to visit for us, if we have friends or family over. This makes visiting at least the restaurant at the Tryp Gran Sol Hotel an absolute MUST for all Alicante visitors! and the Mediterranean sea. What a nice hotel.